In Aqueduct, Course Administrator users are responsible for exam standards, utilization, and identifying learners who will require access to scheduled assessments. If you’re a Course Administrator, please follow the instructions below to create an exam roster which can then be downloaded and forwarded to Aquifer’s exam management team. You will find resources for successful exam management here. 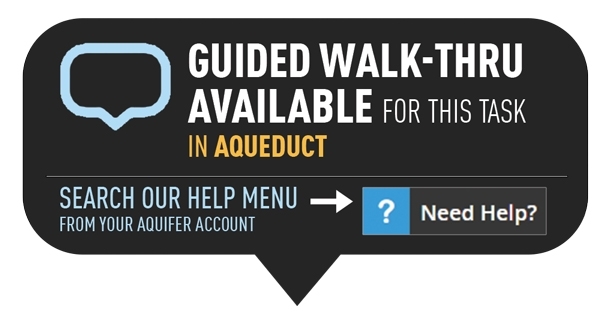 Please note that a Custom Course is required in order to utilize Aquifer Exams. Learn how to set up a Custom Course. FROM WITHIN YOUR CUSTOM COURSE: Choose the More Actions button on the top right-hand side. From the Course Management page, use the right-hand column to select those users who will need to be rostered into the exam. Please verify that your list is correct before moving onto the next step – Review the list of student emails. Please ensure that no student is listed as UNKNOWN UNKNOWN. If they are, please contact those students directly and have them complete their registration. Students not registered are ineligible for exams until they have completed their registration. When all students are correct, Choose Exam Roster button in the top right-hand corner. An Excel CSV file with a roster of these students will download onto your computer. Attach the downloaded file to your Exam Request Form. You can expect to receive a confirmation email that the roster has been received and is being processed. If you have any questions or concerns, please direct all inquiries to [email protected] or call the exam helpline at (603) 277-2060.